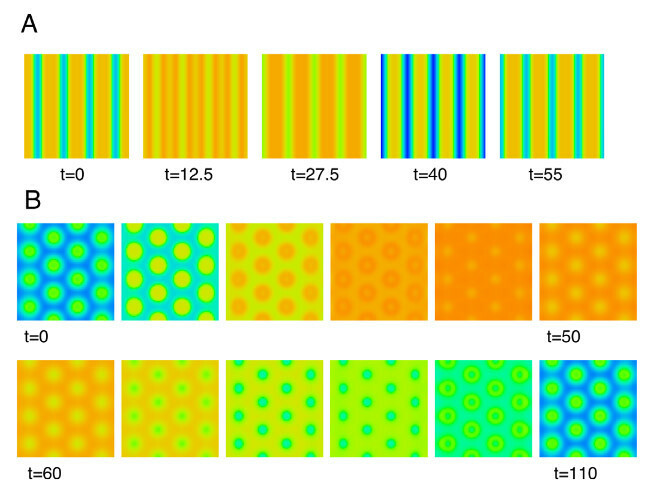 We present a model for flicker phosphenes, the spontaneous appearance of geometric patterns in the visual field when a subject is exposed to diffuse flickering light. We suggest that the phenomenon results from the interaction of cortical lateral inhibition with resonant periodic stimuli. We find that the best temporal frequency for eliciting phosphenes is a multiple of intrinsic (damped) oscillatory rhythms in the cortex. We show how both the quantitative and qualitative aspects of the patterns change with the frequency of stimulation and provide an explanation for these differences. We use the Floquet theory combined with the theory of pattern formation to derive the parameter regimes where the phosphenes occur. We use symmetric bifurcation theory to show why low-frequency flicker should produce hexagonal patterns while high frequency produces pinwheels, targets, and spirals. When the human visual system is subjected to diffuse flickering light in the range of 5-25 Hz, many subjects report beautiful swirling colourful geometric patterns. In the years since Jan Purkinje first described them, there have been many qualitative and quantitative analyses of the conditions in which they occur. Here, we use a simple excitatory-inhibitory neural network to explain the dynamics of these fascinating patterns. We employ a combination of computational and mathematical methods to show why these patterns arise. We demonstrate that the geometric forms of the patterns are intimately tied to the frequency of the flickering stimulus….